Rent a private villa on the Caribbean Sea in Hopkins with all the comforts of home. For the ultimate independent experience, right smack in the middle of Hopkins Village are your accommodation solution with kitchen, porches, rocking chairs, hammocks, Wi-Fi and A/C. This apartment rental is only a 30 second stroll away from the beach and right on top of Motorbike Rentals & Alternate Adventures offices. Latitude 17Â° is the perfect location to integrate in the village life and combine it with some Belizean adventure tours. 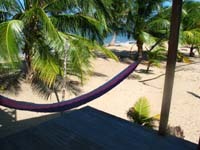 Our beachfront rooms and apartments are right on the Caribbean beach in the heart of the Garifuna village of Hopkins, Belize. We are located directly in the center of the village, within walking distance of all Hopkins’ restaurants, bars, stores, cafes, and other attractions. Relax on the beach in our beautiful hotel style rooms, or enjoy a family vacation in our beach apartments, right on the sea! In the quiet and charming Hopkins Village you’ll find All Seasons Guest house. We’re just a minute away from the beach and offer private and spacious cabanas and rooms. With restaurants, rentals and tours nearby, your vacation can be as laid back or as adventurous as you like! Nothing is better than a calm and safe location to give you peace of mind and a piece of heaven! 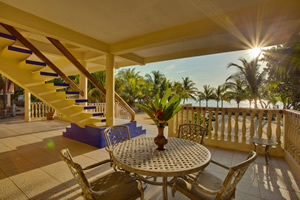 Hamanasi is your ideal boutique Belize resort hotel. Vacation and relax in a spacious treehouse, beachfront room or honeymoon suite with handcrafted hardwood furnishings, air conditioning and private porches. 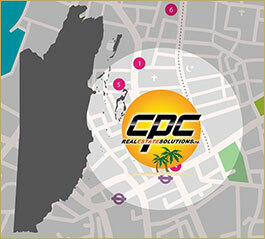 Is located on over 300 acres of wilderness with over 1,000 feet of our own prime white sand beach. It is a friendly, laid-back experience with an abundance of Belizean hospitality to share! 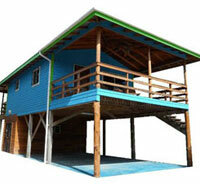 At Jaguar Reef we have set a new standard for quality and value in Belize! Whether you dream of peaceful time on the beach, warm ocean swimming, diving on the world’s second longest barrier reef or exploring ancient Mayan ruins, Sarkiki serves as your perfect base. Our 14 large, 3-level, and two 1-level, eco-friendly, waterfront villas all offer stunning ocean views. Two larger units accommodate up to 6 people. Ammenities include 3 pools, 2 swim-up bars, a large common patio area, basketball court, TV and internet. Welcome! For more information, please click here and please tell Mike and Linda that CPC sent you. Located in a residential area near the northern end of the Placencia Peninsula, Green Tower House provides a serene, contemporary guest environment just steps away from the Caribbean Sea. The 3 bedroom, 2.5 bath home is fully equipped for your convenience and enjoyment. Just relax and take in the ocean breeze or get out the bicycles or kayaks and go for an adventure. Local restaurants and markets in Maya Beach allow you to decide whether to go out for meals or cook in the fully outfitted kitchen, or maybe on the outdoor grill. Green Tower House feels like a luxury resort with the privacy and functionality of a private home for your vacation. The Windschief is located in Hopkins Village, 1/4 mile south of the village center. There are two beach cabanas, 60 feet away from the waves, equipped with the basic needs: private bathrooms, coffee maker, and fridge. It's the spot for experiencing Hopkins while being connected through their internet cafe or international phone service and enjoy the tropical nightlife at the cocktail bar. Activities include windsurfing and sailing rentals, private or group lessons, beach volley ball, or good tunes while catching some rays on the beach. For more information, please click here and tell Pam & Olliver that CPC sent you.